I was working solo a couple of weekends back and saw this one pop up on Amazon Prime and decided to give it a watch again. It had been years since I had seen the movie and even longer since I had sat down with the book and I was curious to see how well it would hold up- turns out, it's still as excellent as I remember. Late in the Cold War, the Soviets develop a new 'caterpillar drive' for their submarines which render it undetectable to passive sonar. The first ship outfitted with this drive, Red October, heads out to conduct exercises with it's fellow submarine, the VK Konovalov. Captain Marko Ramius (Sean Connery), once out to sea, kills the political officer and gives false orders to set sail for the east coast of America where they're going to conduct missile drills. Meanwhile, CIA Analyst Jack Ryan (Alec Baldwin) flies to Washington to brief his boss, Admiral Greer (James Earl Jones) about the new caterpillar drive, only to find himself briefing the National Security Advisor and more when Greer reveals that Red October has already sailed. While most people think Ramius is a madman set to launch a first strike, Ryan offers another hypothesis, namely that Ramius is actually intending to defect. 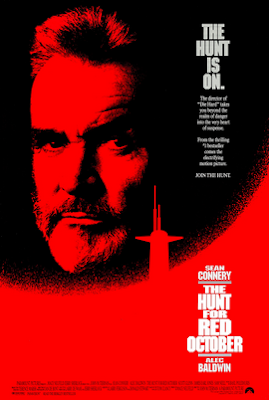 Ryan is given forty eight hours to prove his theory and heads out into the North Atlantic, first to an aircraft carrier and then to the USS Dallas who thanks to it's Captain, Bart Mancuso (Scott Glenn) and their Sonar Guy, Ronald Jones (Courtney B Vance) seems to have figured out how to track Red October. Ramius, meantime, tells his officers that he has sent a letter to the Vice Admiral of the Soviet fleet informing him of his intention to defect, thus committing them to their plan. The bulk of the Soviet fleet is now chasing them, including his fellow captain, Tupolev and his ship the VK Konovalov. On the USS Dallas, Ryan persuades Mancuso to contact Ramius and ascertain his intentions- when it turn out that Ryan's theory is correct, they arrange a rendezvous off of the Grand Banks, where, after a convenient radiation accident to get the crew off of the ship, the officers submerge once more and the Americans board the Red October and Ramius formally requests to defect. Suddenly attacked by the Konovalov, Red October with an assist from the USS Dallas successfully destroys the other sub- and the watching crew thinks that Red October has sacrificed itself to avoid being boarded and the subterfuge is complete. Ryan then welcomes Ramius to the New World and freedom. There's just something about a good old fashioned submarine flick, you know? I don't know what it is, but it gets me every time. Plus, while this film must have resonated more effectively in the latter days of the Cold War, it still captures the historical moment of high tension and Cold War shenanigans between the United States and the USSR perfectly. (And honestly, thinking about it, this was probably one of the better adaptations of Clancy's work... Patriot Games was okay, but is a better book. Clear and Present Danger is- well, I think it's another movie I need to watch again and they completed messed up The Sum of All Fears.) Added bonus: reading the wiki-page of the movie and finding out how much access the filmmakers got to make this movie.